Palaeophragmodictya is an enigmatic taxon with a 'mesh' of linear structures around a circular body. The linear structures have been interpreted as sponge filaments, with the organism originally described as the earliest evidence of hexactinellid sponges in the fossil record (Gehling & Rigby, 1996). Living hexactinellids are commonly referred to as "glass sponges", and are found in the deep oceans. However, there is no evidence of preserved mineralized sponge spicules in this fossil. Serezhnikova (2007) described a new species of Palaeophragmodictya (P. spinosa) from the White Sea of Russia, but the preserved morphology of P. reticulata (featured here) and P. spinosa vary considerably. It may be that future taxonomic readjustment is required within this genus. The attachment discs of organisms are in the shape of a low hemisphere with an uneven, isometric margin. The upper part is covered by a mesh network, while the lower possesses even, spiculate radial structures. The inner cavity has a system of dichotomously branching canals. The fossils are pre- served as impressions of attachment surface with bizonal morphology; the inner zone is concave, distinctly outlined, and the outer zone is flattened, with an indistinct rim. 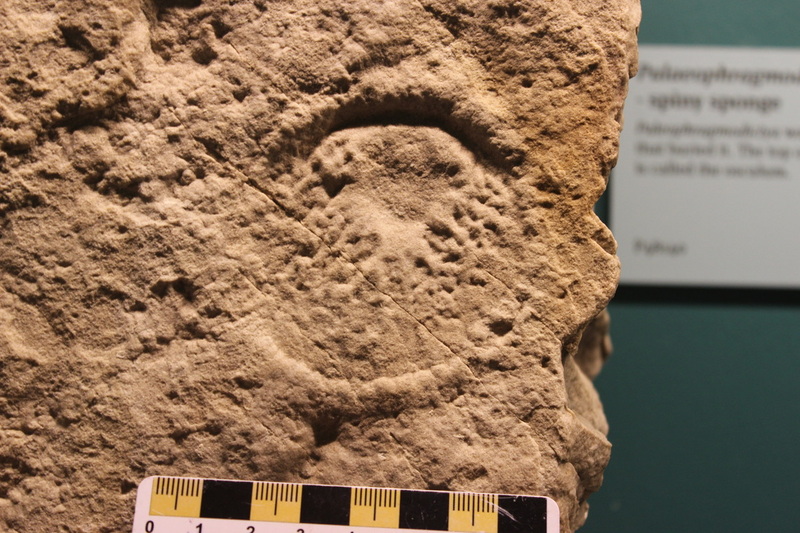 Impressions of stalk-like structures are preserved above some of the disc-shaped impressions.